.. und ich hätte sie sehen können, und hab's verschlafen! Könnte mich immer noch in den Hintern beißen. Neue Single, schon wieder ein Hit. Catchy Elektro-Pop/Disco-Rock-Melange mit integriertem Mid-80's-Bügeleisen. Sehr gut. Leuk genre, ik vind hem best wel goed! Aanstekelijk nummer en haar beste single tot nu toe! auch einer der besseren ladyhawke titel. wegen dem gutem refrain gibts ne knappe 5. hat im vers manchmal die tendenz, abzusacken. sonst einwandfrei. Auch dieser Song lässt das Blut schneller fliessen.<br>Beats, die sofort überzeugen.<br>Vollkommen meine Musik. ▒ Grote Klasse, terug te vinden op hun gelijknamige album "Ladyhwake" !!! Sch****, was für eine geile Electro-Rock-Granate von der Australierin. Mit vollster 80's-Power und fetziger Melodie geht das Teil sofort in die Beine. Da zücke ich doch glatt die 6! Super Entdeckung, die Frau macht geile Musik. 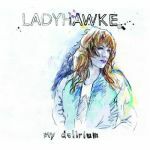 Ladyhawke, die am Asperger-Syndrom (leichte Form des Autismus) leidet, präsentiert hier einen durchschnittlichen Electopop-Titel. Ich kann an dem Track nichts Besonderes finden. she sounds so bored, but i'll give her a good review because this song is still catchy! Hat schon einen ordentlichen New-Wave-Touch, hätte ruhig noch glitzernder produziert werden können. Egal, trotzdem ein klasse Ohrwurm und bislang ja auch ihr größter Hit. Great track which deserved the success it got. The standout from her excellent album. Fantastic song. Wish she did more with her vocals though. Brilliant track. I love the clip too! Nothing good, just TRASH! Peaked at number 6 on my personal bubbling under hot 100 songs and number 23 on my personal alternative songs during 2009. Uitstekende popmuziek van een artieste die echt de ultratop verdiend had. Good track, but not a great track. It does seem to drag a bit. Possibly missing some real punch. Geht gut ab, der Track! Schöne, sehr positive und gute Laune verbreitende Nummer. Der ganz große Kick fehlt mir jedoch, deshalb verpasst dieser Titel auch knapp die 5. Not as good as Black White & Blue I don't think but maybe that's because my expectations were higher for this one and I already knew this a little bit. Awesome track! Very happy it hit top 10 in Australia! My opinion of it now hasn't changed 4 and a half years <br>later so I guess I can count that as it aging well. 3.2. Seriously amazing song here. The guitar riff sounds quite like Jet's She's A Genius, but this is better. It's the rising guitar(?) in the background that makes this great though, rising to a screech at the end of the chorus and it complements her voice wonderfully. even though the pre-chorus is slightly lazy being repeated in the second verse, the vocal melody is engaging to listen to, so it doesn't become tiresome. I also love that quiet part in the last third of the song, great little change-up there. I haven't reviewed this, huh? Here goes...<br><br>It's great.